A Zoning By-law is the primary tool that the City uses to regulate land use. The Zoning By-law establishes different categories of land use (zones), each having its own set of permitted uses and the regulations that apply to the zone (setbacks from property lines, maximum area of a property that can be built on, amount of required parking, etc.). There are two parts to a Zoning By-law. The first part is the mapping (schedules) that show where the various zones apply in the City. The second part is the text that contains all the various regulations. The City of Niagara Falls has four Zoning By-laws that apply to various areas of the City. Chippawa and the lands north of the Welland River are regulated by Zoning By-law No. 79-200. The portion of the City previously part of Willoughby Township is regulated by Zoning By-law No. 395 (1966). The former area of Crowland Township is regulated by Zoning By-law No. 1538 (1958) and the Humberstone area is regulated by Zoning By-law No. 70-69. An interactive map for Zoning By-law No. 79-200 can be viewed here: Zoning Map. 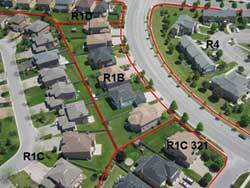 For details of the zones labelled on the zoning map, please refer to the text of Zoning By-law No. 79-200. Zoning information for properties in the former Willoughby, Crowland or Humberstone Townships can be obtained by contacting the Planning Division. 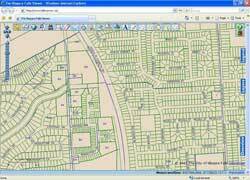 Paper copies of all of the City's Zoning By-laws can be purchased at the Planning Division. If you require help understanding any of the information in the Zoning By-laws, please contact the Senior Zoning Administrator at ext. 4296. The City is working on a new Comprehensive Zoning By-law to replace the 4 existing Zoning By-laws. The new Comprehensive Zoning By-law will set out the permitted uses of land and the regulations for those uses (building setbacks, minimum lot area requirements, maximum lot coverage, minimum landscape requirements, minimum parking, etc.). A property owner (or someone acting on behalf of the property owner) can apply to have the Zoning By-law changed. This is called a Zoning By-law amendment. The process to amend the Zoning By-law involves a minimum of two public meetings (an open house with staff and a public meeting at a Council meeting). Please note that it takes a minimum of 4 months to go through the entire Zoning By-law amendment process. These applications are available on the Applications Forms page. From time to time, the City will also initiate Zoning By-law amendments to update the regulations. Check the Public Notices section for information on applications being considered at this time. If you have any questions about what is involved in applying for a Zoning By-law amendment or would like more information about a particular application we are processing, please contact the Planning Division. An applicant must meet with Planning staff (staff from other departments/agencies may be required to attend) prior to submitting an application. This meeting is termed a preconsulation meeting and serves to review the proposal to determine what additional information is required to be submitted with the application (ie. stormwater management report, traffic study, environmental impact study, etc. ).